Maui is a full of postcard perfect beaches with a seemingly endless array of outdoor activities, restaurants, shopping and other things to do. It’s no surprise almost two and a half million people visit this busy Hawaiian island each year. Still, some of my favorite places in Maui are the lesser traveled areas that most beachgoers never see. 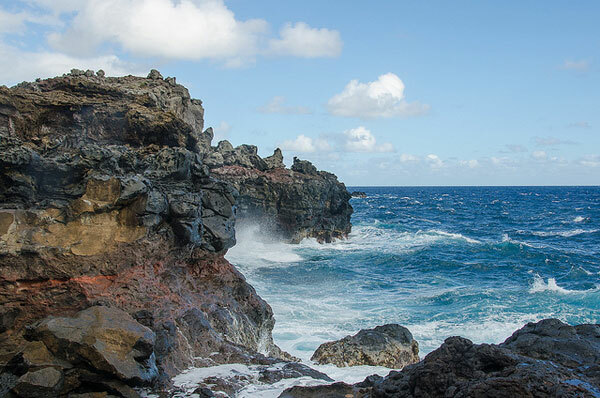 We discovered one of these places on our recent visit: rugged and rocky, Northwest Maui. Only about twenty miles north of the tourist capital, Lahaina, the well-traveled and often congested Highway 30 narrows and the other tourists disappear, leaving you alone to explore this isolated and twisting stretch of road. On a hike in search of a natural blowhole (more on that tomorrow) we spotted this rugged and colorful volcanic outcrop framed by ice-blue waves crashing into the shore. Foto Friday is a series where I go back through my archives to share photos that I love either because I think they are beautiful or they have an interesting story. I hope you enjoy them as much as I do!